The University of Missouri’s School of Visual Studies (SVS) Art on the Move (AOM) Outreach Program presents SVS Director, Dr. Jo Stealey in Bowling Green on Tuesday, April 2. Dr. Stealey will meet with students and teachers to share stories of outstanding SVS students and alumni, their art, their educational path at MIZZOU, and ensuing art careers. Dr. Stealey is Director of the MU School of Visual Studies and a nationally known artist working in mixed-media sculptures and collages using handmade paper, as well as a recognized authority on contemporary fiber and American basketry. Joining Dr. Stealey will be Doris C. Agwu, the new Director of Engagement for MU’s College of Arts and Science. In her new position, Ms. Agwu will oversee existing programs like AOM; shewill work closely with MU Extension and Engagement to develop new programming to promote community engagement and an inclusive culture. An exhibition of artworks by MU alumna, Samantha Edwards will be on display and open to the public in the Bowling Green Middle School Art Room from 12-1 p.m., . Samantha received a BFA with an emphasis in drawing from the University of Missouri and a masters in library and information sciences from San Jose State University. Samantha is an emerging children’s book illustrator and author. Established in 2017, the MU School of Visual Studies merges four disciplines: art, art history, film studies, and digital storytelling. This dynamic program aims to graduate future generations of outstanding critical thinkers, inventive problem solvers, and makers of conscientious, well-crafted art while preparing them for professional careers in the contemporary art world. Art on the Move provides real-life experiences for SVS students and alumni, providing hands-on professional career building opportunities by returning them to their Missouri hometowns or other Missouri communities to share their art and art careers. AOM plays an instrumental role in recruiting the next generation of SVS students. 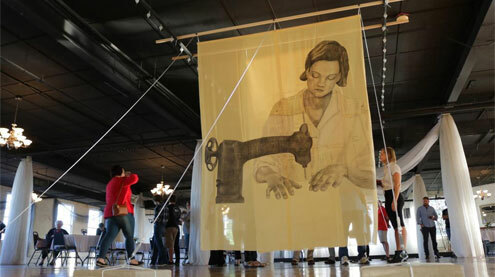 The School of Visual Studies brings the academic resources of the University to communities across the state through collaborative engagements such as the Art on the Move Outreach Program that include MU students, faculty and alumni creating mutually beneficial learning outcomes with Missouri communities. The exhibit and presentation are brought to you by MU School of Visual Studies, University of Missouri Extension and Bowling Green R1 School District.